What a way to serve your Halloween treats! 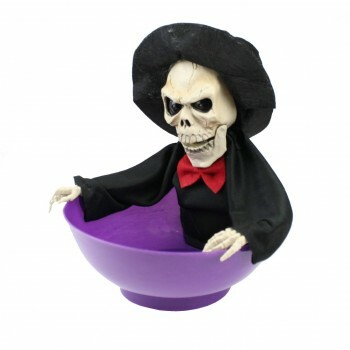 This little skeleton, attached to a bowl, jiggles around, talks, and plays music! The skeleton measures approximately 25cm high and the bowl is approximately 24cm across. Requires 4 AA batteries, not included.